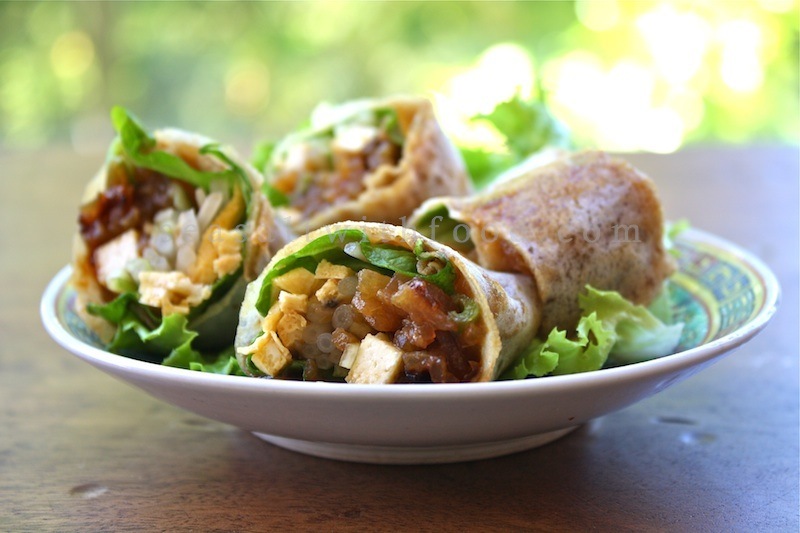 Popiah or Fresh Spring Rolls, are typically filled with a good variety of healthy fresh ingredients. No hard and fast rule here, just fill it up with what you like. 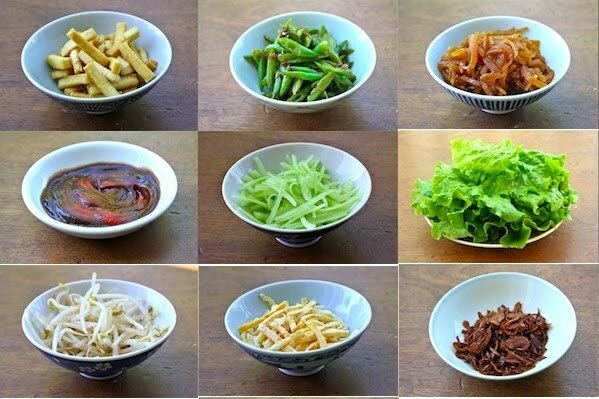 Here is what I usually include in my popiah, sweet sauce over a leaf of lettuce, cooked jicama, green beans, fried bean curds, shredded omelet, fried shallots, blanched bean sprouts, lettuce, cucumber, and thinly sliced fried Chinese sausages, if I have some available. Wrap it all up when you are done and you have a great tasting spring roll! Just omit the eggs and sausages, if you are a vegan. 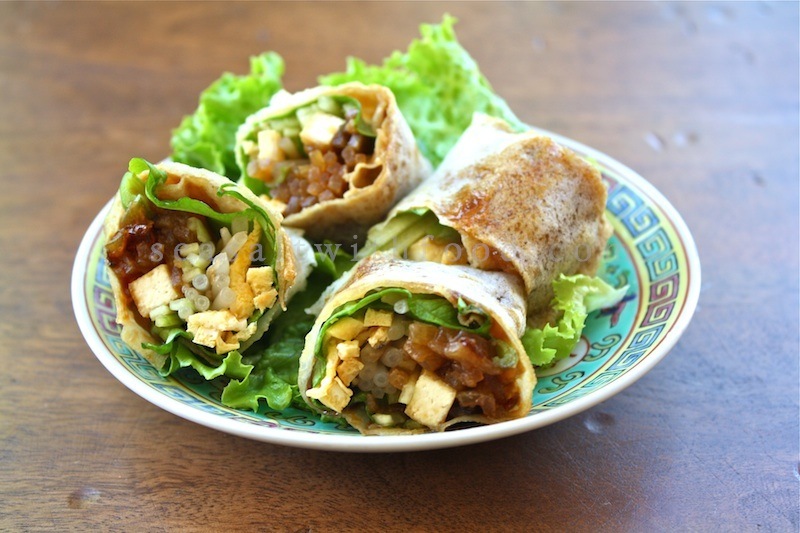 Serving popiah or spring rolls over a casual gathering or party is very enjoyable. Just arrange the fillings in the middle of a table and let your guests attempt to wrap their own spring rolls. It’s quite fun watching everyone try to gather all the fillings into the little popiah skin without letting it fall apart! 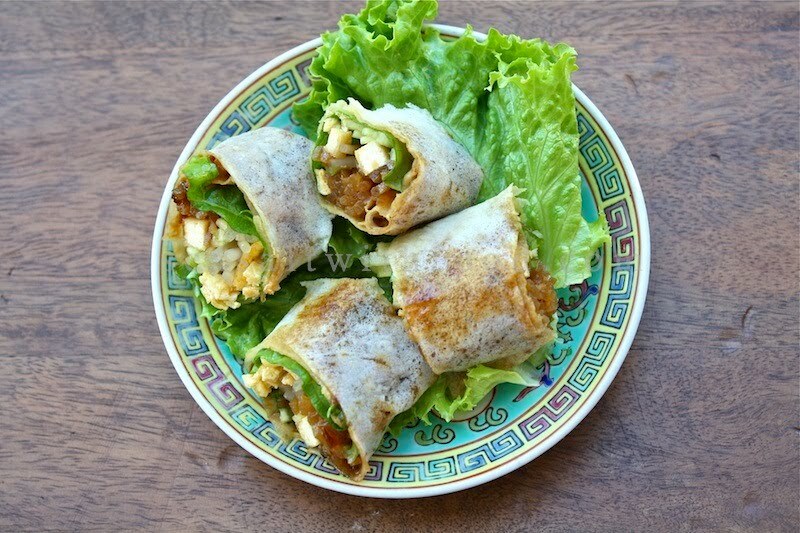 To serve the Popiah: Place a popiah skin on a plate or flat surface and spread some sweet sauce and place a leaf of lettuce, cooked jicama, green beans, fried bean curds, shredded omelet, fried shallots, blanched bean sprouts, lettuce, cucumber, and thinly sliced fried Chinese sausages, if I have some available. Wrap it all up and serve immediately. In a large saucepan or wok, heat the oil on medium heat. Add in the shallots and cook until they are golden in color. Mix in the ground bean paste and stir frequently until the mixture is fragrant. Toss in the jicama and give it a quick stir. Then add in the water, sugar, and dark soy sauce. Mix until combine and bring the mixture to a boil. Lower the heat, simmer for about 1 hour with the lid closed or until the jicama has softened. Season with additional sugar and salt if necessary. In a medium pan, heat the oil on medium heat. Add the shallots and cook until they are light golden in color and toss in the garlic. Give the mixture a quick stir and turn the heat on high. Add in the French beans and continue to stir frequently and add some water as you go along. (About 4 minutes) Season the French beans with sea salt. In a large pan, heat the oil on medium. Pan-fry the bean curd (preferable in a single layer) until light golden in color. Season the bean curd with a big pinch of sea salt and pepper. Drain on paper towel. Cook the omelet in 2 or 3 batches, drain on paper towel. Then finely shred the omelet. Oh my gosh!!!!! You are amazing Angie. Listen to me, you are A-M-A-Z-I-N-G!!!! To have to go through all that prep work, in no decades I will do it for my friends!!!! But it was great fun to watch this space so thank you!!!! This is one of my favorite dishes, too. But the prep involved does make it best suited for large gatherings. Lovely presentation. I have never tasted nor heard of popiah, which is why they sound so exciting! I would love a big mouthful of these filled with goodies wraps. Oh yummy. I was just thinking about popiah yesterday.Yours look really really good and chocka-full of yummy goodie stuff. I love big bitefulls too! @Anh: Thanks and do try the recipe. Just finished trying your popiah recipe along with the fresh made wrapper skins. Worked out very well indeed! A small taste of Singapore here in Montreal! hi, can i know what you meant by tim cheong? is it the kicap soya manis -the thickened type? Tim Cheong aka sweet bean sauce.